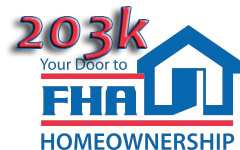 The 203(k) loan is a simple way to purchase a HUD Home that may need cosmetic and/or structural repairs. You get a loan for the purchase price and a loan for remodeling all in one loan. It is a simple way to purchase a property and have the money to make repairs. FHA’s Streamlined(k) program permits homebuyers to finance up to an additional $35,000 into their mortgage to improve or upgrade their existing home. With this new product, homebuyers can quickly and easily tap into cash to pay for property repairs or improvements, such as those identified by a home inspector or FHA appraiser. What makes this loan more attractive is that the changes to the property can be cosmetic as well as meet minimum property requirements. There is no minimum repair cost threshold of $5,000. The Streamlined(k) program is intended to facilitate uncomplicated rehabilitation and/or improvements to a home for which plans, consultants, engineers and/or architects are not required. • Weatherization, including storm windows and doors, insulation, weather stripping, etc.